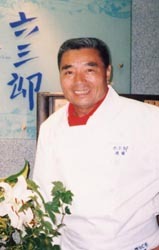 He is one of the best and most famous chefs in Japan. He was born in Ishikawa June 3,1931. Best viewed with Netscape Navigator 4 or Internet Explorer 4 .